September is here and I’m totally going to pretend that there’s a chill in the air and pumpkins are everywhere. 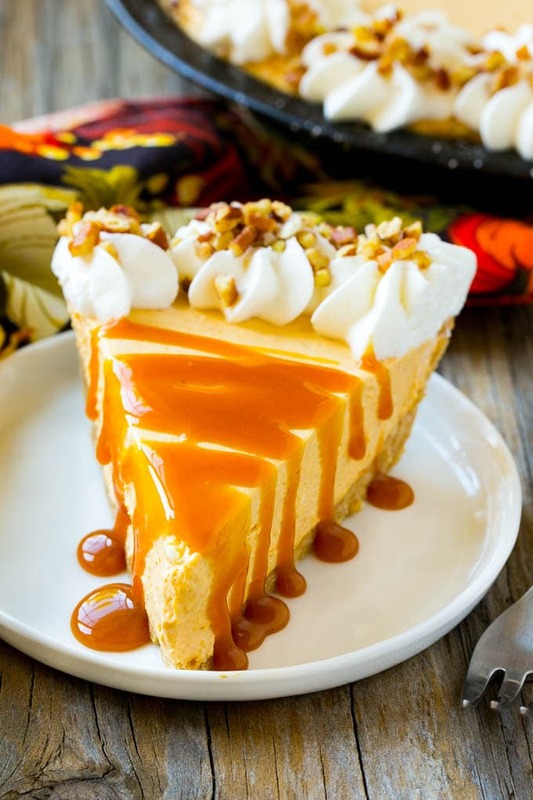 In reality it’s been over 100 degrees here and there’s nothing fall to be seen, but that doesn’t mean we can’t have a slice of no bake pumpkin cheesecake anyways! I shared this pumpkin gooey butter cake about 2 weeks ago, and now it’s time for another pumpkin dessert that doesn’t even require an oven! Let’s talk about the crust first. You could totally go to the store and buy a pre-made graham cracker crust. But you should only do that in a pinch, because a homemade graham cracker crust tastes SO much better. You can even swap out the graham cracker crumbs for gingersnap crumbs if you like! The crust mixture gets pressed into the pan then chilled until firm. The filling is a simple mixture of cream cheese, pumpkin puree, brown sugar, spices and whipped topping. If you don’t like whipped topping, you can use the same amount of whipped cream that’s been whipped to soft peaks. After the filling goes into the crust, it needs to chill to set up. 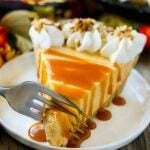 This pie can be made a day before you plan to serve it, which is perfect for holidays like Thanksgiving when you’re looking to plan ahead. 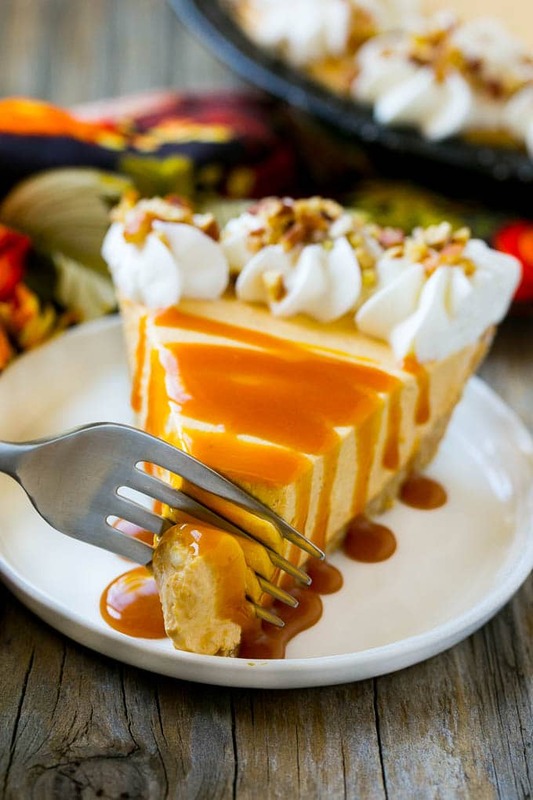 I finish this no bake pumpkin cheesecake with whipped cream rosettes, chopped pecans and a drizzle of caramel sauce for the ultimate pumpkin dessert! I use a piping bag fitted with a large star tip to make the whipped cream rosettes. 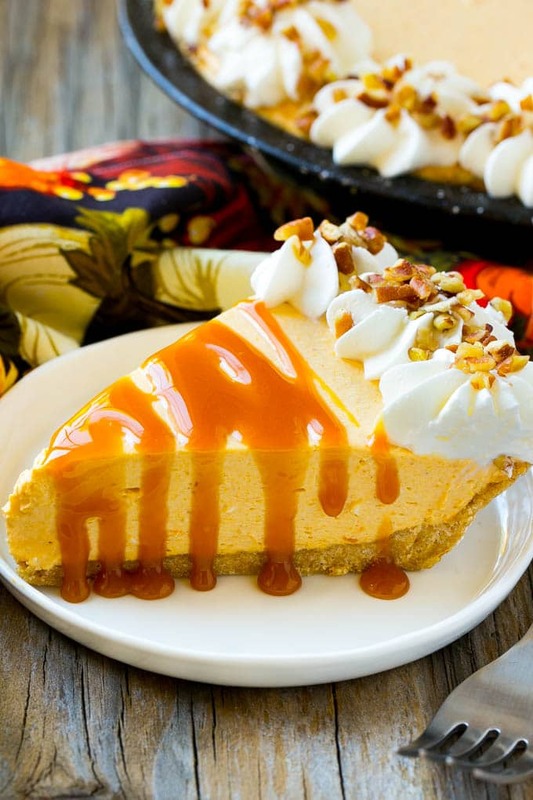 I’m not even a huge pumpkin pie fan, but I do absolutely love this cheesecake. It’s lighter in texture than a traditional cheesecake and definitely easier to make – no water bath, no cracks, no fuss! 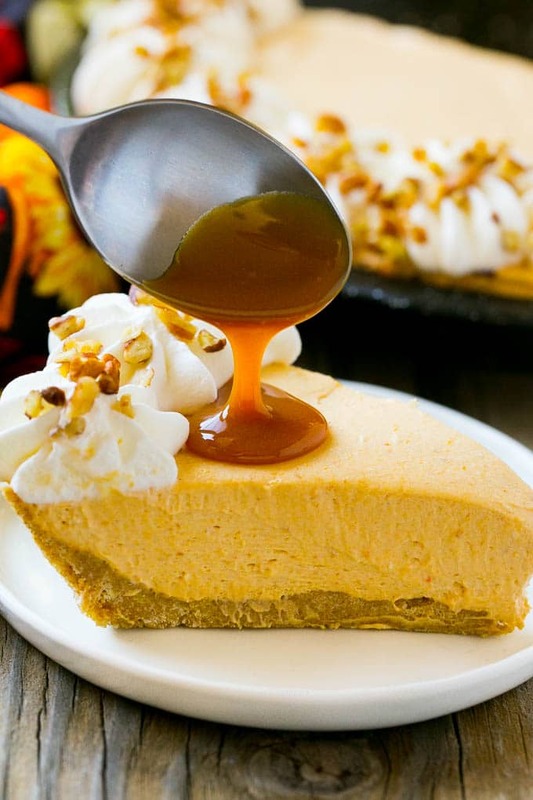 This no bake pumpkin cheesecake is light and creamy, the perfect fall dessert to end any meal! Top the cheesecake with caramel sauce for a show stopping finish. Coat a 9 or 10 inch pie pan with cooking spray. In a medium bowl, mix together the graham cracker crumbs, sugar and butter until thoroughly combined. Press the mixture firmly into the bottom and sides of the pie pan. If you're using a 9 inch pie pan, you may not need all of the crumb mixture to cover the pan. Place in the freezer and chill for 20 minutes. While the crust is chilling, make the filling. In a large bowl, using a mixer, beat together the cream cheese and pumpkin until smooth. Add the brown sugar and pumpkin pie spice and beat until thoroughly combined. Gently fold in the whipped topping. Remove the crust from the freezer and spoon in the filling, smoothing the top with a spatula. Refrigerate the pie for at least 1 1/2 hours or up to 24 hours. Prior to serving, decorate with whipped cream, whipped topping and chopped pecans if desired. Cut into slices and drizzle approximately 2 teaspoons of caramel over each slice, then serve. You can make it two days ahead, the pie is actually refrigerated not frozen. Only the crust goes into the freezer to set while you make the filling. I would refrigerate the undecorated cheesecake for 2 days, then add the whipped cream and any toppings right before serving. Hope that helps! Thanks Sara, that helps a lot! I made a half batch in a smaller tin to test the recipe and have almost eaten the whole thing already. 😉 For the crust, I used Biscoff cookies, which are cinnamon-flavored, and it tastes great. I love how light the pumpkin mixture turned out. I had actually forgotten to buy the whipped topping, but I made some whipped cream on the spot per your comment, and it worked really well. I will definitely be making this for our upcoming “Friendsgiving” this weekend. I know two people who are allergic to eggs, so I will send this their way too! What a great idea to use Biscoff! So glad you enjoyed the recipe, Happy Thanksgiving! If I make this 2 weeks ahead of the party can I freeze it? You can freeze it, but I’d recommend adding the whipped cream, caramel and pecans after it’s thawed and ready to serve. Can you substitute whipped cream for the whipped topping? Yes you can, just use freshly made whipped cream, not the kind in a canister! Looks really good and easy too. I think I’ll try it with ginger snap crust. My family would love this! It’s going on my Thanksgiving menu! Love that it can be made the day before! This looks so good! I’m so ready for fall and all of the pumpkin recipes!